A few weeks ago, the boys and I finished reading the New Testament and were slated to dive into the Old Testament when I was offered for review What on Earth Can I Do? from Apologia Educational Ministries. Because of this offer, we’ve been working on this instead of strictly reading the Bible; the program allows us to use and think of the Bible in “real life” ways, which has been really helpful. 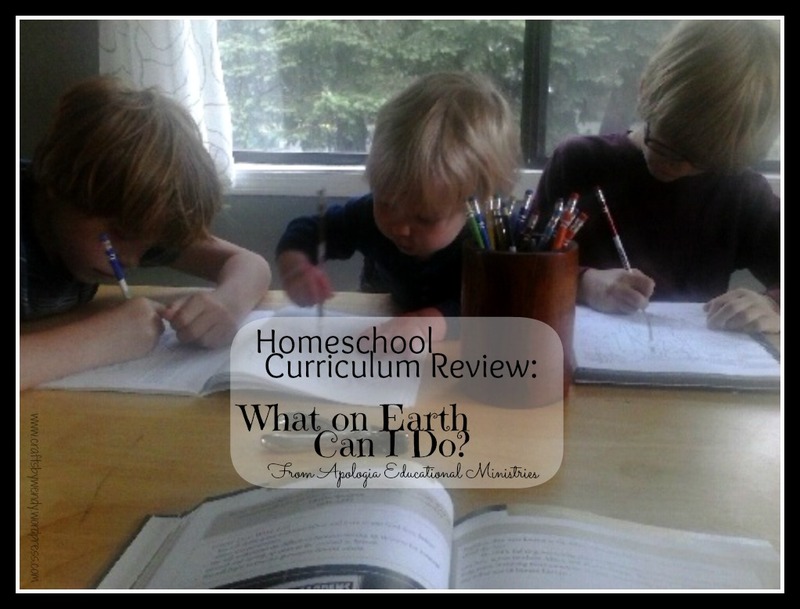 As part of this curriculum, I received four books: the What on Earth Can I Do? hardcover textbook ($39); the What on Earth Can I Do? Notebooking Journal ($24); the What on Earth Can I Do? 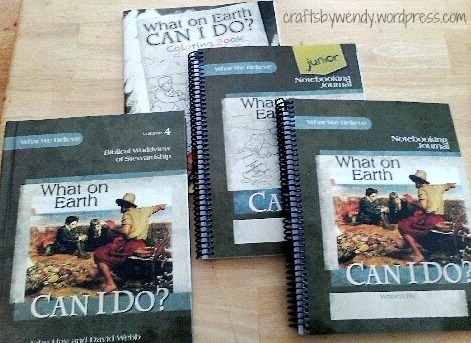 Junior Notebooking Journal ($24); and the What on Earth Can I Do? Coloring Book ($8). (Everything but the textbook is softcover.) What on Earth Can I Do? is the fourth part of Apologia’s biblical worldview training program “What We Believe.” We haven’t done the first three parts, but that wasn’t a problem; they don’t build on each other. What on Earth Can I Do? focuses on having a biblical worldview of stewardship and is geared toward kids in elementary school – roughly grades 1-6. The Bible is a very important book to our family, but it’s one that I struggle to teach. Reading and teaching are two very different things, and the latter is difficult. Because of that, and the fact that we’d just finished the New Testament (as I mentioned earlier), the timing of this program was perfect for us. I love it when that happens! And having this be “open and go” curriculum was frosting on the cake. Use of this product is really easy. There are 8 lessons, and each is designed to take about two weeks with three lessons per week (we went a little slower and used it 4-5 days per week, but still finished each lesson in a two-week span). There’s a suggested schedule in the front of the two Notebooking Journals, which we followed loosely. Each session starts with some sort of read-aloud. Some days it’s pretty short – a couple of pages of introduction to the lesson. Other days it’s quite long – 10-12 pages of story (some fictional, some retellings of Jesus’ parables) that demonstrates the heart of the lesson. The long days didn’t feel long, though, thanks to the great writing of John Hay and David Webb. I found this to be a good time for some read-aloud time with the boys, but you could easily have older children do the reading on their own, so long as you’ve also read the material so you can discuss it with them. Discussion is very important to this curriculum. Once the reading and subsequent discussion is done, there are activities in the Journals for the kids. These range from coloring pages to note-taking pages to crosswords and more. Because we were blessed with both the regular Journal and the Junior version, Seahawk and Munchkin each got their own. Seahawk got the regular one since he’s older. This one has a lot of required writing. There are questions for both comprehension and critical thinking for both of the longer stories of the lesson (the fiction and the parable). There are complex crossword puzzles and word searches. And there are lots and lots of blank pages for taking notes. You may recall from an earlier review I wrote that Seahawk isn’t a strong speller (and dislikes writing because of that – we’re still working on him), so I did a lot of the writing for him. But rest assured, all of the answers were his! The Junior Notebooking Journal is very similar to the regular one, but everything is easier. There are coloring pages instead of questions (but the questions are also in the text book, so if you have only younger kids, you won’t miss out on the discussion possibilities by using only the Junior Notebooking Journal). The crosswords and word searches are only a fraction the difficulty. The mini-book activity is the same in both. Because Munchkin’s Journal had coloring pages already, Seahawk was the main beneficiary of the Coloring Book, although both Small Fry and Munchkin helped him on occasion, as you can see from my photo at the beginning of the post. The lessons we’ve finished so far have followed the fictional Edwards family, who live in England during World War II. I like this because we get some “recent” history in with our Bible lesson. This series of stories has opened up quite a bit of discussion about that time in history. Each lesson also includes several one-page articles about relevant people and places. We’ve had mini-lessons on Maria von Trapp, Dietrich Bonhoeffer, Lou Gehrig, and St. Paul’s Cathedral in London, to name just a few. But our favorite part of every lesson is the retelling of Jesus’ parables. These are much longer than their biblical counterparts, offering a few made-up details that don’t appear in Scripture (primarily giving names the characters). They are so well done, though. I look forward to reading those each time. Part of the discussion/written questions (depending on how you choose to do them) includes having you go back to the Bible and read the real parable that the story was based on and doing a compare/contrast. I loved that. It’s fabulous that they don’t just give you “their version” of a piece of the Bible without making sure you go back to the source. It’s clear that the folks at Apologia are “Bible first” kind of people. I can say without a doubt that I recommend this series. The books are very well put together, both in content and workmanship. The activities go well with the lessons, and the lessons are a good length (we spent between 30 and 60 minutes per session). 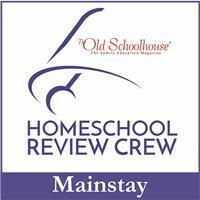 If you’re looking for a great way to implement the Bible in your homeschool, this is definitely something worth taking a look at. Still not sure? You can access the first lesson in its entirety (two weeks worth of curriculum!) for free on the Apologia website. You do this by clicking “What on Earth Sample” from the page I just linked to. It’s available as a PDF download. 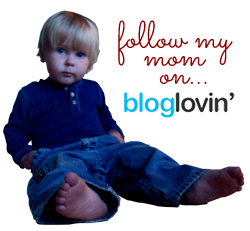 Additionally, you connect with the Apologia people on Facebook, Twitter, Google +, and Pinterest.